I have spent a considerable amount of time today staining Aidan’s new changing table. As soon as I finish it and get it in his room, I will post pictures. 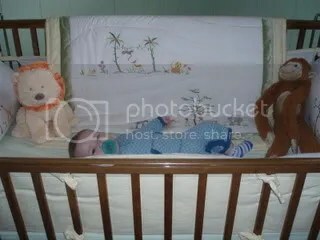 My mother got Aidan an oak crib at a thrift store before he was born. It is very pretty. We couldn’t find a changing table that quite matched, so The Pastor had one made for us. (Jimmy at our church made it.) The Pastor and I had some confusion as to who would stain it. I thought he said he would, he thought I said I’d do it. I figured I might as well get out there and stain it or Aidan would be out of diapers before we decided who should do it. So, our new changing table is stained. I have a little more work to do on it and then it will be in Aidan’s room. I have also been doing the prep work for many sewing projects. I really hate the prep work that comes before sewing. I figured if I did a lot of it at once, I could do more sewing some other time. So, I measured and cut and ironed for about an hour this morning. I went to Sir’s last week while I was visiting family and friends. I got a bunch of fabric. All that fabric and I still, of course, need (want) more. Anyone wishing to donate fabric or notions to me can do so. I love fabrics! I am very excited about my next few projects. They are gifts, so I won’t be posting pictures of them until they have been given.